Dresses make good presents, right? I owe my sister-in-law a birthday present and had bought her this vintage Hawaiian dress to wear at my mom’s beach house, where us ladies like to roam the joint in muu-muus. That’s a true story. Mine’s green. Sister’s is red and white, our mom’s is leopard print. SIL, who loves pink, didn’t have one, so I thought about hemming the original maxidress a little to fit her. It’s really good heavy fabric and has this great scoop back. What if she and her 4-year-old had the same dress? What if I hemmed the thing to the knee, a length she’s more likely to actually wear, and use the *good* foot of fabric at the bottom to make a dress for my niece? I pulled out my little girl patterns and found a handful of possibilities for my niece. The halter patterns on the left are very summer, but I think in the spirit of the muu-muu, I’m going with the dress on the right, the one with the ruffled skirt. I think it’ll fit the fabric I have better, too. Thoughts while I hem the original dress? 4-year-olds still like to match their moms, right? I bought this silk sweater set at the Salvy even though at a 1X, it was too big. The silk was lovely, the muted red color is fantastic and sweater sets are in fact perfect for my work. Also, the bigger size meant the whole thing was longer than normal. And I’ve bought August Silk sweaters before – they last forever if you don’t dry the hell out of them. Seemed like a worthwhile refashion. Pulled in the sides. That’s it. Go see the how-to if you like. The wide neck turned into de facto cap sleeves so I don’t need the top layer in the office. Thinking now about adding ruffles using the scraps I cut off the sides and this trusty how-to. And one for big mama, too. 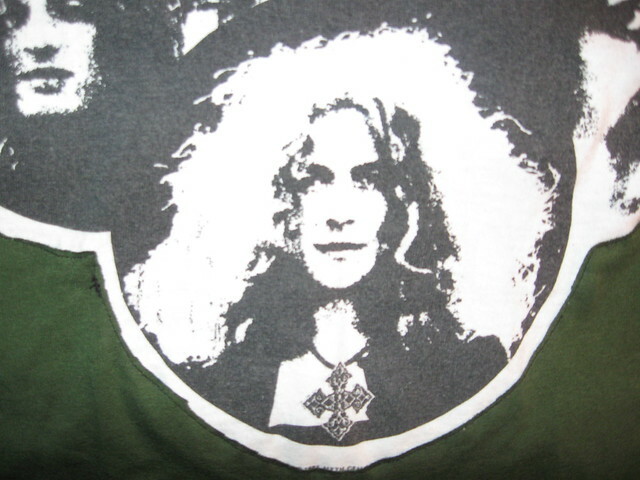 Mama’s shirt took more time and more hair-pulling compared with Poppa’s. I found this Buddha t-shirt for $1 at one of my favorite Salvy’s in the world early in her pregnancy. Finally got the nerve to chop it right before her baby shower but didn’t quite make the deadline. Anyway, she had about six weeks to wear it and seems to love it and it turned out a perfect fit. I had to buy a new craft T and opted with a fitted one from JoAnn because Mama has a small and delicate frame, and I wanted the top of the top to fit her nicely. So the logo was going over her belly. I thought about chopping the bottom off the plain T, but I ended up chopping the belly out of it, and fitting the logo back on. I also chopped about three inches off the bottom hem off the big logo T to make a tie – and to keep the nice hem. The logo part got gathered on the sides, to make a pocket big enough for a full-term belly and sewn back on across the front and sides. Look how cute she is! This surgery makes a cute maternity top with hip sash from a small plain T-shirt and a giant logo-printed shirt. You use the logo shirt as a sort of pocket for the big belly. Make sure the top T-shirt fits the top of your lady’s frame. Measure where the belly starts to protrude (right under the bosom) and mark with chalk. 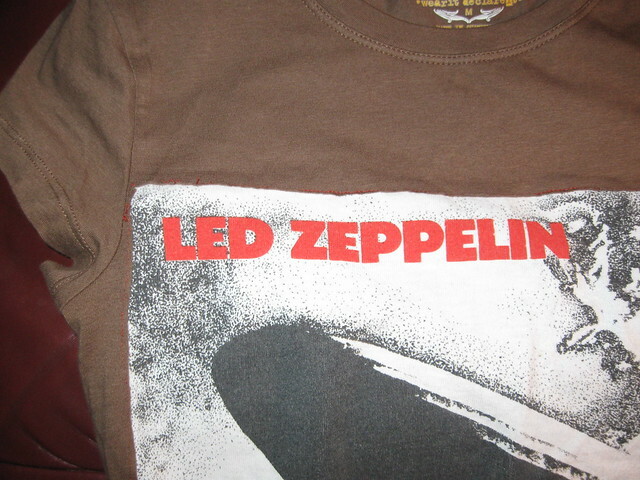 Carefully cut across the front (only the front) of the shirt. To open the sides up, measure about an inch away from the T’s side seam on the front and cut. Figure out where you want the logo to go. Cut across the giant T right below the arms, and slice up the back to open up the fabric. Fit the logo into the front and trim accordingly. The logo fabric should hang down below the hem of the plain T a few inches. Chop off the hem of the giant shirt. If you have room, chop off a few inches at the bottom of the giant shirt and put that fabric aside to reuse the finished hem. With a long basting stitch, baste the top of the logo piece and along the sides. Pin the center top of the logo piece to the center of the plain front. Pull the gathering threads until the it fits. Pin. Baste in place if you like. Finish the bottom. If you chopped off the hem of the giant T, pin roughly the center back of it to one side of the shirt. Pin along so you have a sort of sash at the bottom, easing so the sash ends up longer than the shirt. Remember the front of your new shirt is a lot bigger than the back. Stitch. 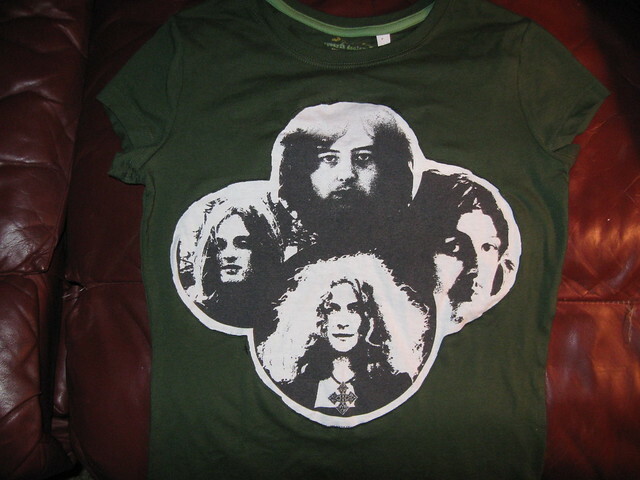 Courtesy of my sister in Philadelphia, who transformed a classic Led Zeppelin shirt that had seen better days into two shirts. 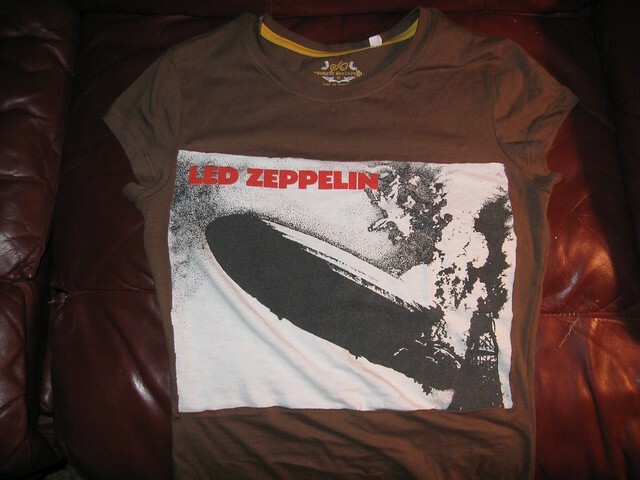 Zeppelin thrifted by me for $.99 at my favorite Salvy in the Roxborough neighborhood of Philadelphia. New backing shirts purchased by her on the Kohl’s clearance rack. Check out the how-to here. Now that we’re settled into new digs and I have established a one-in, one-out policy, I can pop into the thrifts again. And two of my favorite thrift stores are near my south suburban job. At one in Markham, I scored a big bag of knitting and crochet needles. I don’t typically spend a whole $4.50 on one item, shopping the sale items even at the thrift store, but the giant size 17 and 19 knitting needles alone made the purchase worthwhile. Also included were extra long 8s and 9s, shortie 8s and 9s in plastic (better for flying), a slew of smaller crochet hooks, and some giant sewing needles good for weaving in ends. Original knitting stash came from an amazing yard sale in Haddon Township, N.J., while shopping with my mom and sister-in-law and baby niece. I think that was another $4.50 purchase, which included some giant orange plastic needles and a tapestry case. My knitting is getting braver. I was only able before to do knit and purl in straight lines. But then this tutorial got me thinking about wavier lines, too. Like most of you, I have stashes of yarn and fabric that wants using – I mean, I acquired this stuff because I wanted to make fabulous things. So let the making continue. More to come on the fans and feathers pattern results, including a teeny adjustment to make the texture more uniform on both sides (i.e., make my mistakes less noticeable). I’m dreaming of a very feathery Christmas. As I write these words I know they’re wrong. I know it’s wrong to deal with emotional turmoil using a shopping cart. I’m also having quite a time at my job, and am tired to singing the same song to my Crafty Mister, who, to his credit, doesn’t tire of hearing it. My office is in a terrible part of the Chicago area, in a built up McMansioned, retail hell containing fake-blue-water fountains, “upscale” chain stores and restaurants, and flocks of entitled drivers of ridiculous, expensive vehicles. Also, it’s 22 miles from my home and though we changed offices this year, the Powers did not even consider proximity to public trans for the 5 of us (out of 9) who live in the city, close to said public trans. Grrrrr. The only upside to working in awful materialistic suburbs is the thrifting (grocery shopping is convenient, too) . A-holes who live at malls shed a lot of clothing, and leave all kinds of quality merch at 2 particular Salvy stores – one on the way home, one that requires a little more of a trip. And since my taste differs from the Mexican ladies who shop the one, and the Polish and Palestinian ladies at the other, I usually hit the jackpot. Last week while passing each store, I stopped in. Bunch of these goodies will go to Etsy. Bunches of the purple sort will stay in my closet where they await me. I used to skeeve thrifted shoes because they’re harder to clean than your standard hot-water-washable blouse. But now that most shoes are made so cheaply from “man-made materials,” I prefer the older leather ones. Can’t always drop $90 on a single quality pair, especially a pair meant for fun, and I don’t want to drop that on shoes that only go to the hated office. Ashamed to say I feel better. Sleeping standing up. 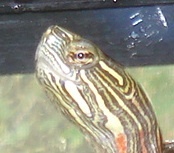 Nose pokes out. Want fitzfab in your inbox?